This guide 6 Ways on How To Wear Smart Casual Sweaters; will steer you away from the sartorial roadkill typically associated with knits (and old men) and towards a sensible (and warm) sweater selection that’ll lead you through winter sweat-free. 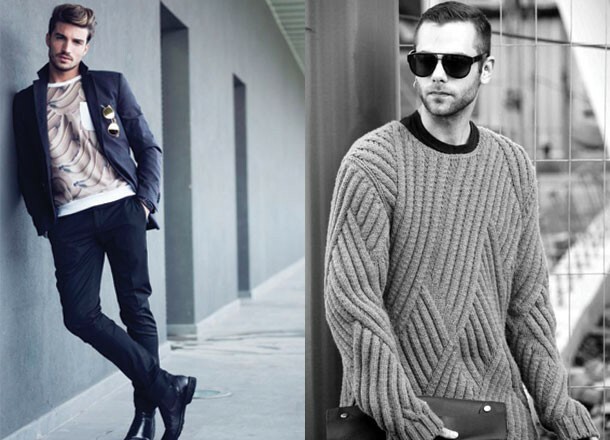 Sweaters are far more playful fashion pieces than most men tend to think. A sweater is a stylish way to layer up a blazer-chino look; while wearing a coloured or printed sweater on its own gives life to a noiseless tee and jeans outfit. A cluey buyer won’t touch a sweater that’s made from synthetics. You should aim to purchase garments made from cotton or merino wool. Cashmere is a luxurious alternative, if you have the means. The benefits of these fabrics will be clear to those of you with an understanding of the superiority of natural fibers; they have a natural texture, ventilate well, and retain a natural shape over time. Leave the polyester-viscose pullovers in the final clearance tray (even if they’re a third of the price). Here’s where you can experiment. Ribbed, cabled, and waffle knit variations offer their own advantages; adding depth to plain ensembles and visual interest to monochromatic colour choices. The choice of weave can also determine the garment’s thickness – heavier weaves are naturally more suited to the nastiest parts of winter. Thin, plain weaves have the most range, as they can be worn solo in autumn, as a layer in winter, and again by themselves in spring. Personal preference will determine this to a large degree, but we can’t resist telling you what to do anyway. As a rule, you should wear a slim, tailored sweater if the rest of your kit is tailored. The loose scoop neck that you wore to inter-varsity lacrosse five years ago won’t flatter your favourite Brioni number. 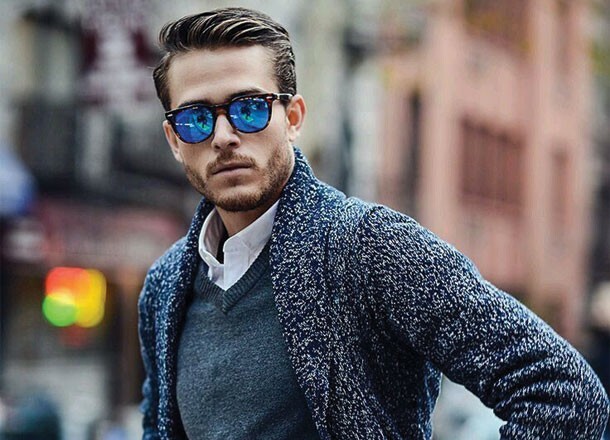 By the same token, skinny jeans might look mismatched with a plump shawl collar cardigan. Chunky knits are good for casual layering on your days off, slim thin-weave sweaters are the go for the nine to five. The workhorse of knitwear and the first kind a guy should buy. Crewneck sweaters, also known as pullovers or simply jumpers; originated as activewear before it became a ‘thing’ in high street style circles. If you spend half your time begging the HR girl to install ducted heating, your best bet is a thick cable crewneck. If it’s just a matter of finding the right layer to go over a shirt before you chuck on a blazer; a thin merino wool crew is the first and last choice. For a prep-inspired approach to the boardroom; wear smart grey chinos, a white oxford button-down, and navy merino crewneck with a brown knitted tie. Arch-nemesis and eternal rival of the popular crewneck! The V Neck sweater initially took the same road as the crew neck, then a left turn at the collar shape. 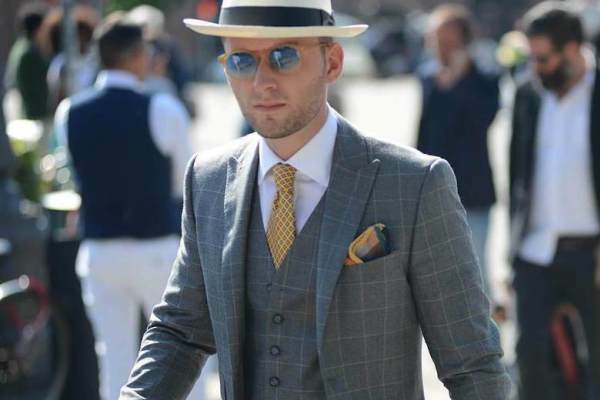 This gives you a bit more flexibility with other sartorial accouterments you might want to include; like that bold novelty tie you’ve been itching to show off to the guys in the office. On the style front, use seasonal tones with your corporate kit. 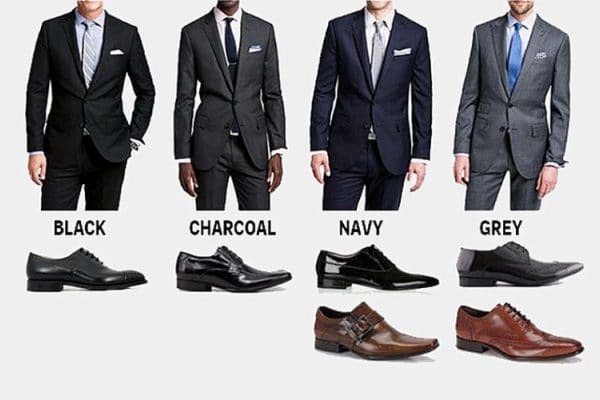 Think brown and grey to contrast a navy suit. Otherwise, more unconventional colour choices have cropped up this autumn. Infamous; Timeless; Sleazy; Masculine! 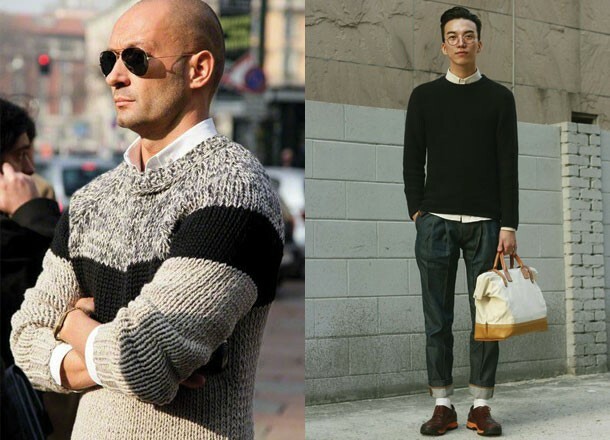 The rollneck sweater is heralded as many different things by many different people. All we’ll say is that this piece of 70’s menswear royalty has punched its way out of sartorial damnation seems poised to continue keeping men warm this winter. The rollneck was hugely successful at various stages in the 20th century; before its sartorial relevance tragically diminished. 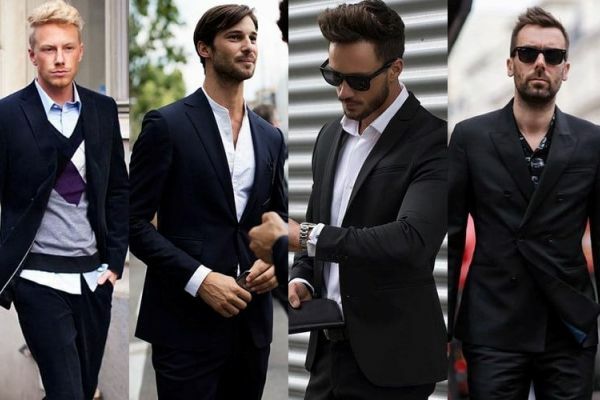 The late 2010’s, however, saw its emergence from the ashes in both luxury and general menswear markets (the jury is still out on whether Archer is the culprit). Rollnecks are tremendously versatile – you can find thin monochrome wool numbers to wear with a suit or thick two-tone options for casual weekend layering. 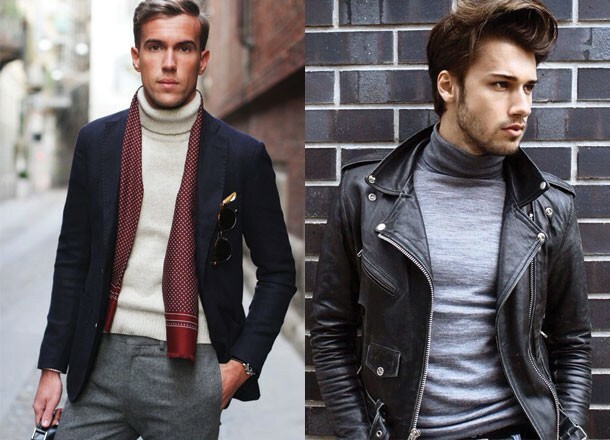 The rollneck isn’t for everyone, sure, but its understated masculine aesthetic and sartorial adaptability; means it’s likely to persist through winter 2018 and beyond. Thick knits with prominent rolled collars are the ticket this season. Consider neutral colours in camel, beige, and khaki tones to mix and match with your winter layers. For a punchy monochrome outfit, wear a slim navy merino rollneck with a super130s charcoal suit. If that’s not cutting the mustard, there’s always the timeless chunky rollneck and biker jacket combo. If your leather jacket days stayed behind in our 20’s; then a navy double-breasted jacket, khakis, and grey turtleneck is an appropriate; (and dashing) afterhours outfit where the shirt and tie aren’t invited. The shawl collar hasn’t quite escaped the scrutiny. However, this winter heavyweight deserves a concerted defence of its sartorial merits; and it seems poised to re-enter the young man’s wardrobe this year. Shawl collar sweaters are usually constructed from wool or cashmere in a ribbed weave. This process thickens the fabric by using heavyweight yarns across the warp or weft to raise the density of the garment. 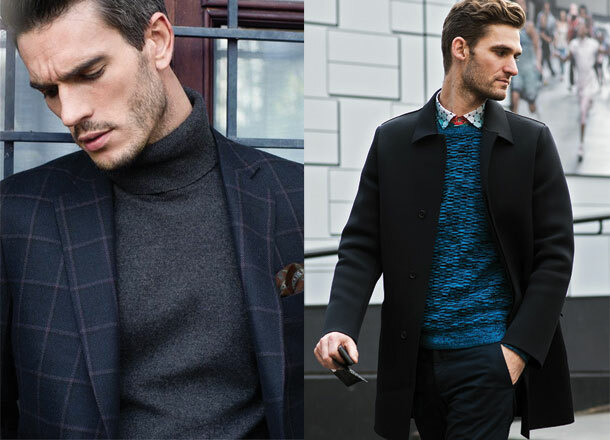 The shawl collar knit is worldly and adaptable. They can add a debonair, sophisticated edge to your overall look; without making you look like a stodgy professor. 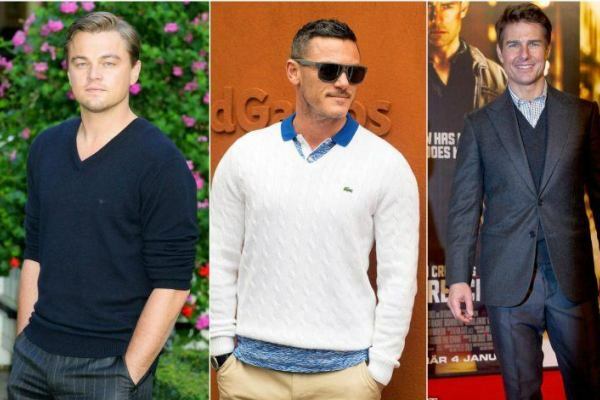 Button-up shawl collar sweaters are smarter than their pullover cousins, and certainly more versatile. You can wear these with ties (knitted works best) and leave them unbuttoned; when a casual dress code is the expected order of business. If your blazer is starting to make you sad (and cold); take things up a notch by combining a prince of wales shirt, grey shawl collar sweater, and your dressy work pants. And you aren’t limited to smart casual tailoring. Shawl collar sweaters, a white tee, and jeans will see you through almost any weekend contingency. Originally the less popular brother in the familial triad of round neck sweaters! Over 2017 and the new year, however, the scoop neck has emerged as solid competition on the knit market. Unlike the crew neck (which has a narrow collar and slimmer proportions) the scoop neck normally has looser shape; although slim options are never far away – and a wider open neck. Designers have been featuring scoop necks with heavy textural detail. Ribbing, waffle, and cable weaves are abundant on the market. This style lends itself to casual ensembles with an unpremeditated, low-effort aesthetic. Think a grey cable knit with black jeans and chukka boots; finished off with a contrasting blue or maroon fisherman beanie. Top it off with a khaki anorak for supreme winter insulation that looks pretty damn cool at the same time. Unfairly condemned as the grandfather’s sweater of choice; the button-up cardigan has resurfaced from the sartorial pit as something young blokes can (and should) wear without bursting into tears. The cardigan is a fair alternative to a tailored waistcoat; especially in winter where its thermal qualities will have you saving dollars on the quarterly gas bill. 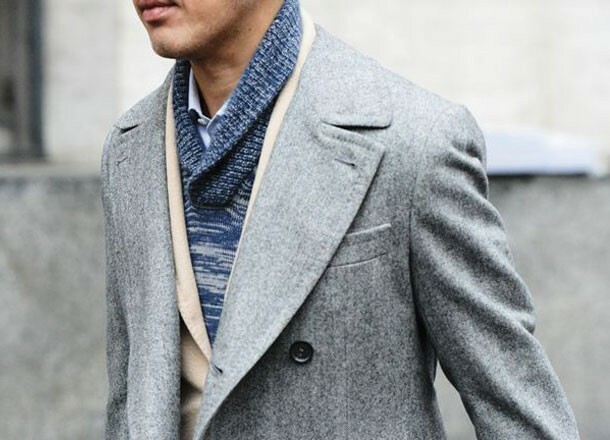 Due to its thin construction and lack of lapels, the cardigan should be worn with a shirt and tie. The shirt collar and extra layer of fabric from the tie will add density to the upper portion of your outfit and contribute to a balanced look overall.